Sam vs. Lupus: Is Your Friend or Relative a Vampire? Is Your Friend or Relative a Vampire? Labels: Lupus, Not a Vampire. Another difference--vampires supposedly die on the spot when hit by sunlight. Lupus patients simply have all sorts of painful, miserable symptoms brought on by sun exposure so that they might wish they were dead, but they don't actually die, at least not quickly. HINT: a pulse is another good tip-off. And don't leave us hanging on the botox story. *I* have been left hanging on the botox story. No emails, calls, returned emails, etc. 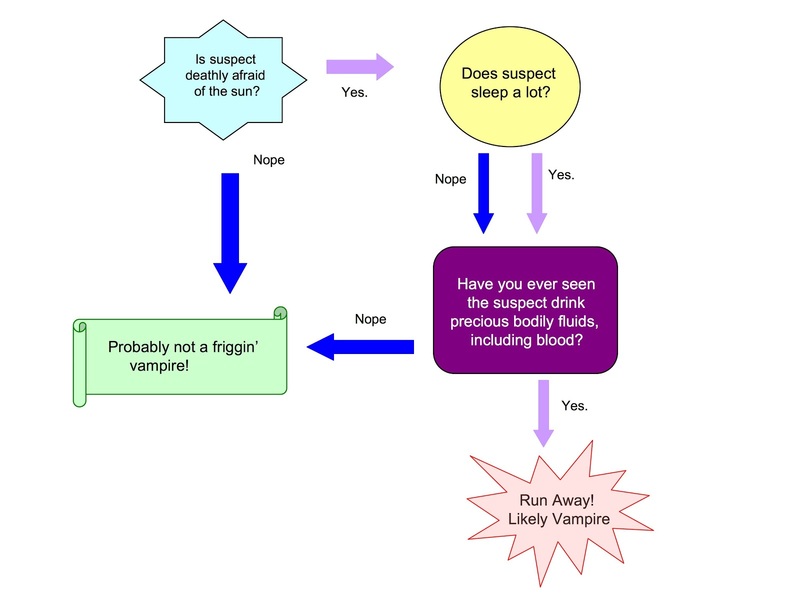 And you'll notice that this is a culturally diverse vampire chart...I made no comment to the effect of "If you've seen the suspect holding a Rosary, she's probably not a *%^# vampire." Wait a minute. That's not a given. During the vampire craze I read a YA novel (as a galley--not yet published, and I haven't actually seen it come out) that had New Orleans populated with very high society vampires. There was a lot of discussion about the big upcoming holiday--"Mardi Gras." But it doesn't make any sense to celebrate Mardi Gras unless you're planning to celebrate Lent, which only makes sense if you're going to celebrate Easter. I felt very puzzled by the whole set-up. But then I'm the one who complains about books that have mysterious prophecies discovered woven into tapestries or painted in caves--but without prophets or a deity to give the prophecy. Sorry, but I expect religion to make some sort of sense, even if only a little. Meanwhile, best hint that the person in front of me is not a vampire--the fact that the person is there in front of me. Good luck with the whole botox and a medical system apparently on botox. Hilarious! My next door neighbor told me that he thought I was a vampire (and he was dead serious) because he never sees me come out of the house while the sun is shining. I started laughing and he told me he wasn't joking. An uncomfortable silence followed before my brain clicked in and I decided to try and explain my sun sensitivity to him in a way that would not support his theory of vampire-ism. Yikes. The ignorance of people is...amazing.